what would you all recommend for paint? I think i recall seeing some marine expoxy paint at Lowes but it's been a few months. I was planning on staining and and finishing the thwart and gunnels. Is shellac a good finish for this? I know this is going to take a beating. I think I'll also close the ends in for floatation and to keep water out of them. And I thought I was getting close But the list keeps growing. The journey to a finished boat is as much fun as using it. I am not normal I guess. grant83 wrote: The journey to a finished boat is as much fun as using it. I am not normal I guess. You're as normal as it gets around here Grant . It sure looks good on the water - congratulations on a fine job. I've just replied to a post asking about clear finishes and the same info may apply to you. Have a look at single pack exterior urethanes. I've used one with "marine grade" on the front of the can and found it long lasting - still good after 4 years. This was a solvent based urethane and I understand that solvent based coatings are becoming hard to find in the USA now but it may be worth having a look. From the what it's worth department , which does not carry any weight since it is not my boat and all of us like them differently. But anyone who would paint a great looking boat like this one. Needs to be shot at sunset. I know it is your boat and a great looking one for you to do what you want with it. Just do it justice if you paint it and make it look even better. Just make sure when someone asks you where you got it to tell them it is a wood boat and you made it. PS. I have seen quite a few the guys have painted and they look really sharp , I like the natural wood. You as the builder know where the mistakes and Bo Bo's are but the person admiring it while asking all sorts of questions will not see them. 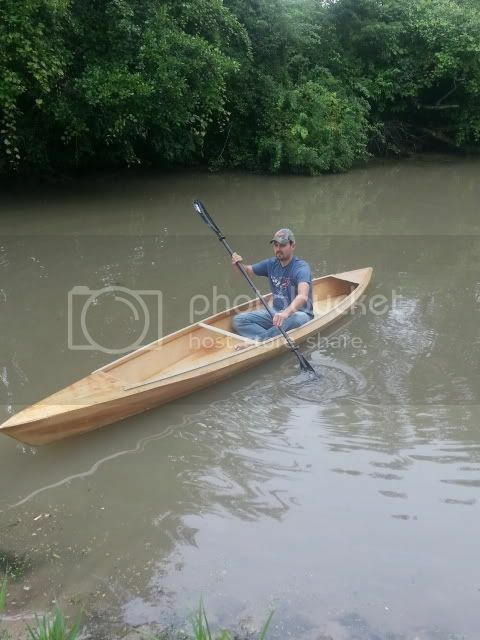 When a person builds there own boat they make it there way and it's one of a kind and not like the mass production boats off of a assembly line. Gunnels and thwart are now stained and the first coat of Spar urethane is on and curing. That is some smelly stuff. I'd suggest a well ventilated area. I am thinking of taking her out this weekend and chasing some fish. I'll have to post some more pictures soon.